Read Slavic fairy tales from Aleksander Chodzko, Parker Fillmore and others in an abundant online collection. Jump to full list of Slavic tales. About: Slavic folk tales and fairy tales are abundant and enduring. Slavic folklore arose from the need to give meaning to the hardships of life, and to understand the brutal world around them, the foreboding forests, the thunderous seas, and the wars that raged. 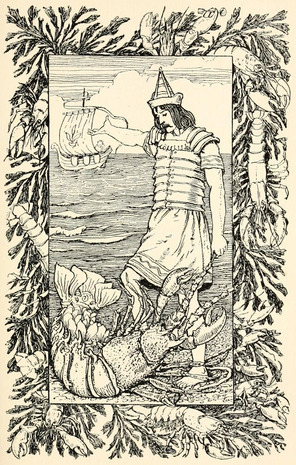 “Soon there came a crowd of crawfish, and amongst them a gigantic lobster as large as a year-old calf.” Illustration by Emily J. Harding, published in Fairy Tales of the Slav Peasants and Herdsmen by Emily J. Harding (1896). George Allen. Steeped in dark myth and wild legends, Slavic folk tales paint a world of witchcraft and sorcery, a land of superstition. They were more than fairy stories; they were a way of life. True, Slavic myths provided adult entertainment around the campfire at night, but the stories were also the basis and the bond of a community’s values, beliefs and traditions. Even to this day, heroes from folk tales are honored with holidays and widely celebrated throughout the Slavic regions of Russia, Ukraine and Romania. Christianization affected Slavic mythology as gods and goddesses were replaced with religious icons, and vampires and werewolves were fought now by a holy brotherhood of Christian believers. For the Slavs though, much to the vexation of the Priests, Christianity was more of an addition to their ancient beliefs than an actual replacement. Wide and wonderful tales, Slavic folklore is full of mysterious and frightening beings and intrepid heroes. Spirits and demons may be fickle, one day friend and one day foe, with no rhyme or reason. Slavs must be quick on their feet and wise in their hearts to outwit the monsters that haunt their land. Popular authors of Slavic folk tales include Aleksander Chodzko, whose collection Fairy Tales of the Slav Peasants and Herdsmen features 20 tales of Slavic origin. Parker Fillmore’s The Laughing Prince also features tales from the region.